« How Not To Landscape in Maryland: Part 1. How Not To Landscape in Maryland: Part 2. Continuing our series from last week on common landscaping mistakes, The Atlantic Maintenance Group is here with some more tips on how to steer-clear of easily avoidable landscaping mistakes. While this is a pretty broad topic that can get into some advanced landscaping, you’d be surprised how many Maryland homeowners ignore some of the most basic principles of plant placement when designing their lawn. Often this is a result of design over time, placing plants as their purchased rather than working from a blueprint, which is why it pays to have a plan and a landscaping company with experience in designing them. It’s important to think about any plant in terms of when and where you’ll be looking at it, it’s fully grown size, and to remember the general principle that large groupings always have more visual payoff than dispersing plants evenly across a yard. 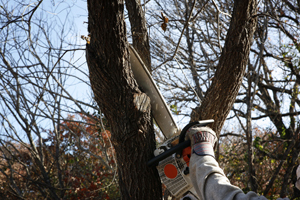 Many amateur Maryland landscapers take great pride in keeping ahead of their bushes and shrubs, running out, shears in hand, when they get the pruning itch. This can often cause plant death or prevent blooming. Make sure to research when the best time to prune your shrubs is and adhere to a schedule, or consider calling a professional landscaping company. Want to Avoid the Hassle and Mistakes of DIY Landscaping? Call the Atlantic Maintenance Group. Don’t waste money making costly mistakes over and over again while still failing to achieve your perfect landscape, call a professional that can get the job done affordably and right the first time. To get your free quote today, give us a call at 410-768-4720 or contact us via our website today. Remember to check back next week for Part 3 in our series on How Not to Landscape! This entry was posted on Tuesday, November 11th, 2014	at 2:47 pm	and is filed under Blog, Lawn Maintenance Service, Lawn Tips	. You can follow any responses to this entry through the RSS 2.0	feed. Both comments and pings are currently closed.